ALS has completed another challenging oversized cargo project from Montenegro to the USA. 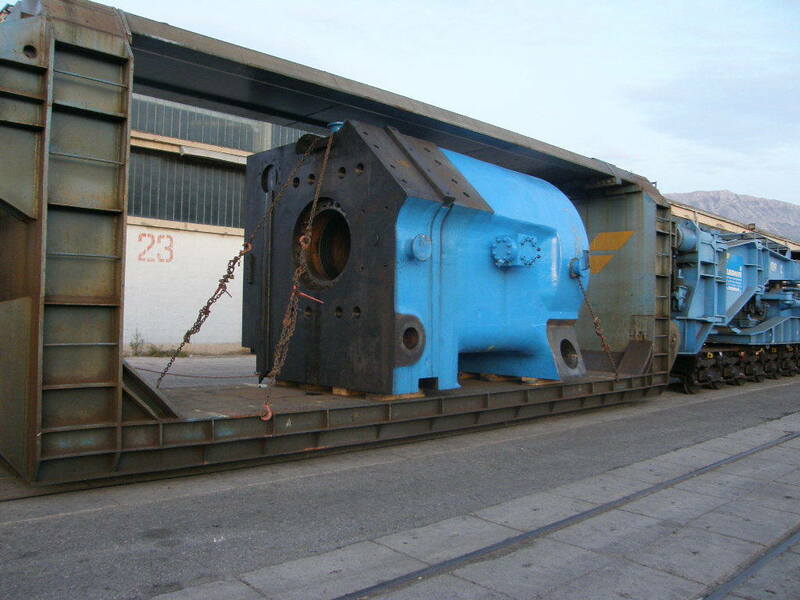 The 2 industrial forging presses consisted of 97 break bulk items totaled 2,400 T and comprised of the heaviest piece weighing 235T, widest piece measuring 4.35m and longest piece totaling 13.60m plus 35 containers, which included general purpose, high cube and open tops. The project, named “Project Thunder” involved the provision of shippers own containers, an assortment of load carrying equipment from standard trailers, 5 axles semis, 8 axle semi and 24 axle modular to cranes and rail wagons for the transport of the heaviest items. 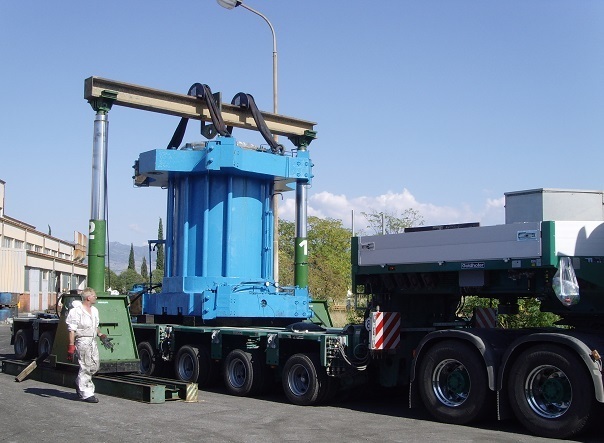 In addition ancillaries for dismantling involved the transportation and return deliveries of 9 abnormal loads and 10 standard loads from the UK to Montenegro. There were many difficulties that ALS had to overcome including language barriers and a number of local cultural issues including, bureaucracy, local rules & regulations. ALS provided on-site support for the final three months of the project. This involved the production of paperwork for each load as the cargo was transported on carnets, arranging permits, over seeing the loading, arranging the transfer to port, undertaking route and bridge surveys and attending meetings with various government bodies and local authorities to gain approval for the required transport methods. The industrial presses were the largest ALS had been involved with for Firth Rixson. Unfortunately the heaviest pieces could not be transported by road from the job site to the port of shipment, as the country’s infrastructure was unable to take the weight of the loads. Therefore, ALS’ solution was to arrange for an on-site movement move by 24 axle modular trailers to a rail head, transferring the cargo by rail using a rail wagon from the local town to the port and then transferring from rail to ship using mega lift systems and heavy duty bogies. Lifts were co-coordinated with Firth Rixson’s appointed supplier who provided the necessary expertise and equipment for the lifting, jacking, skating and skidding of all the heavier items, using a variety of lifting & handling equipment. The project involved transportation movements by road and rail from the site in Montenegro into storage at the port, where they were transferred on to a charter vessel. The main challenges faced and resolved by ALS revolved around the transportation of the 5 heaviest items (1 x 235 T piece and 4 x 175 T pieces) where various modes of transportation were considered including river, road and rail. Transferring the cargo by river using barges was not a viable option as there were no navigable waterways between the site and port. A road option was submitted but not accepted unless bridge-strengthening work was undertaken. The route involved travelling over 15 bridges, which crossed over a mixture of rivers, streams, gorges, railway lines and farm tracks! The rail option was chosen as the most suitable method primarily due to the proximity of rail lines at the job site and port of shipment. The only obstacles to overcome were the: sourcing of necessary equipment from Austria and obtaining necessary permissions. On the rail route no bridgework or strengthening work was required. Planning for this project commenced in June 2009 with site visits in Montenegro. The job commenced in earnest and movements were carried out over a four month period at the end of 2009. The project involved ALS offices throughout Europe including: the UK, Holland and Italy. Colleagues from ALS’ UK and Dutch offices attended the job site over several weeks to oversee key stages of the project, which moved over a four month period. Many items only required regular permits, which took a matter of days to organize. However, the application for permission to transport the 5 heaviest items by road took several weeks and involved route surveys, a full bridge survey, a full risk assessment of the proposed road route and structural surveys of key bridges. ALS and its client Firth Rixson were still following the permit process for the road option when permission to use the railways was granted. The presses were installed at Firth Rixson’s new closed die manufacturing facility in Georgia. “Thanks to ALS, the 35 containers and 97 pieces of break bulk cargo that represent our press were transported from their origin to dock, loaded to ocean going vessel, and then discharged flawlessly……, all within budget and ahead of schedule. “We could not be more pleased with the performance of your team and the subcontractors you selected, particularly regarding the professional level of communication and coordination provided to us. “On behalf of Firth Rixson I would like to thank you for your contribution to this project and congratulate you on a job well done. We would not hesitate to call on ALS in the future” – Manager, Firth Rixson Limited.